Applying tabs is now fast, neat and super easy! Excellent for businesses, schools, religious groups, clubs, organizations, print shops and others for newsletters and mailings. Simply insert the mail piece – from a single page tri-folded letter to multi-page booklets – into the Staplex Tabster® and it instantly applies the self-adhesive perfect tab around the edge. Remove the mail piece and the Staplex Tabster® tabber machine electronically advances and is ready for the next mail piece! Mail without envelopes! The Staplex Tabster® saves the cost, mailing weight, stuffing and sealing time of using envelopes! Now preparing mailings are faster and more economical – from your laser printer to the mail stream in minutes! 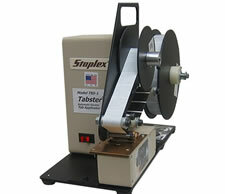 The Staplex TBS-1 and TBS-1.5 Tabsters tabber machine really are the perfect helper!